As this episode of The Clone Wars begins, a large Republic battle group appears above the planet Geonosis. We then cut to the flagship, where Obi-Wan and Ki-Adi-Mundi are discussing the war. (Side note: Ki-Adi-Mundi looks and sounds very good in this series. Very authentic to what I imagined he'd be like.) Anakin joins them on the bridge, followed by Ahsoka, and the two discuss their kills during a recent battle near the planet Dorin. I like that the two of them have a little competition going on. It emphasizes how well they work together, and it also underscores the coping mechanism they have chosen for dealing with such a monumental conflict. Obi-Wan, surprised that Anakin and Ahsoka are regarding the situation so lightly, tells them to focus on planning their upcoming mission. The three Jedi are joined in their mobile war room by Masters Windu, Unduli, and Yoda, along with Chancellor Palpatine. The Jedi lay out their plan -- a three-pronged assault on Geonosian front lines with the end goal of destroying the enemy's shield generator. The Chancellor worries about the potential for immense casualties, but Yoda emphasizes how important the mission is. I like how Palpatine says he'll leave the strategy to the Jedi -- in reality, he's orchestrating all of this. A fine bit of irony and a nice nod to those "in the know" vis-a-vis the PT's endgame. The Jedi and clones conference for a while about who will go where upon landing, and the trio of Jedi (Mundi, Kenobi, and Skywalker) agree to rendez-vous at 0700. The Republic cruisers begin to launch landing forces: gunships carrying troops and AT-TEs, escorted by heavy Y-Wing bombers. I have to say, I'm really glad to see more aerial scenes in this episode. The staging scenes for the Geonosis attack were very reminiscent of the Rebels' assaulting the Death Star. And for that matter, the whole Geonosis approach reminded me a lot of Attack of the Clones. The TCW team did a great job with their animation in this scene. Obi-Wan's group launches first, followed by Anakin's and then Ki-Adi-Mundi's. I like Ki-Adi-Mundi's retort to Yularen wishing him luck: "There is no such thing as luck!" 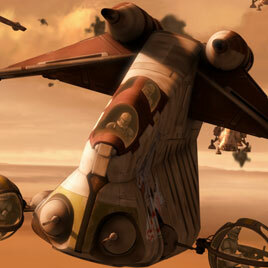 In the heat of battle, Anakin's gunship is soon shot down, taking Ahsoka, Rex, and Master Skywalker with it. Elsewhere on the battlefield, a clone says, "Good thing those bugs can't aim!" and then gets blasted. Now that's sick humor. Ki-Adi-Mundi's gunship falls next, but not before the Jedi's clone commander gets Commander Cody to land the assault walkers. Obi-Wan's gunship, meanwhile, is also shot out of the sky. This opening scene was very intense. I really like the "camera" angles used to portray the urgency of the situation. I do, however, find it a bit too convenient that all the important gunships crash-landed while all the other troop-carrying gunships appear to have been blown out of the sky. I like where the first segment ended, but it felt a little too brief (that's probably due more to the time they had to work with than the story line, so I won't hold it against them). The opening pan shot for the second segment definitely set the scene for a real, vicious battle zone. As Ki-Adi-Mundi and his clone commander pull themselves out of their crashed gunship, we learn that only Obi-Wan's forces made it to the landing zone, but that the General himself was shot out of the sky. Anakin is now engaged with Geonosians on the ground. Ki-Adi-Mundi's AT-TEs are still functional, but they have a long way to go before they reach the rendez-vous zone. Over in Anakin's situation, we see him and his troops pinned down by heavy blasterfire. Ahsoka worries aloud about how Obi-Wan is doing, but Anakin tells her to focus on the mission. I like that Anakin has words of wisdom for Ahsoka vis-a-vis worrying about Obi-Wan. It shows that he understands exactly how to prioritize in combat. This is one of the traits that both enhance Anakin's brilliance and foreshadow how cold and ruthless he will eventually become. Commander Cody, meanwhile, has his AT-TEs in a circle where they were set down by gunships. He tells two soldiers (Waxer and Boil, whom we've seen before) to go look for survivors at the crash site of General Kenobi's gunship. The two soldiers find Obi-Wan and one remaining soldier, and Commander Cody orders his troops to lay down covering fire as the four make it back to the walkers. Obi-Wan and Cody continue their march to the rendez-vous point. As a note about the series overall, the return of Waxer and Boil gives some needed continuity in a series that so far has enjoyed killing off nearly every clone we meet. It has been tough for us to watch clones we enjoyed dying left and right, when really they could have stuck with the Jedi as supporting characters for a few more episodes. (Obviously it wasn't due to voice actor complications.) Continuity is important in television, and I'm glad to see that Dave Filoni's team is thinking about this. Elsewhere, Ki-Adi-Mundi's group is having trouble moving forward. His clone commander contacts Yularen aboard the flagship to ask for air support, but Yularen denies it, saying that he can't redirect forces from other parts of the campaign. However, the admiral does say that General Skywalker appears to be reaching the armored barricade that is blocking the Republic's approach to the shield generator. This particular scene was very exciting because of the visuals from the air and ground fighting. The simultaneous conflict in both locales helps depict the epic scale and reminds me a lot of the Battle of Naboo. Bravo to the TCW team for painting a vivid portrait of this intense campaign. Meanwhile, Anakin's group has reached the barricade, but finds little cover and few ways to breach it short of a full-on assault. Ki-Adi-Mundi and his group split up: his tanks will go around a cave while he takes some clones inside. In this very creepy and superbly-animated scene, the Jedi's clones are surprise-attacked by Geonosians. Anakin and Ahsoka finally decide to scale the wall with backpacks full of thermal detonators and blow up the barricade from the top. They rush past blasterfire and weave between droids, dodging lasers fired by guns embedded in the barricade. They reach the wall and, in a shot reminiscent of Padme's Theed palace wall ascent in TPM, launch grappling devices up the face of the barricade. Here again, this episode shines because of the visuals. The sweeping shots of the droid-infested wall and the Geonosian-infested cavern set an excellent tone for the vast scale of the story. The shots of the open ground battle are likewise impressive, and the movement of the "camera" through the battlefield (panning past blown-up walkers, through holes in walls, past clones getting mowed down) makes me feel like I'm right there. It's also a great way to set the "Band of Brothers" feel for the show in general. As Anakin and Ahsoka defeat the last droids atop the wall, a pair of droidekas emerge from inside to challenge them. It seems as if all is lost -- the droidekas have their shields up in no time and immediately begin blasting away at the two Jedi. All of a sudden, Captain Rex appears, steps inside a droideka's shield, and blast its brain. Anakin takes that opportunity to slide underneath the second one and finish it off. As a side note, I had no idea you could step inside a droideka's shield. That was very clever of Rex. After Anakin and Ahsoka lay their explosives, they launch themselves off the wall ahead of the fireworks. The Jedi slow their descent with the Force, and Anakin does likewise for Rex. With the wall destroyed, Anakin's forces continue onward. Anakin and Ahsoka join up with Ki-Adi-Mundi. While the landing site is finally in reach, it is still surrounded by hordes of Geonosians. Anakin again contacts Admiral Yularen, who this time says he has some good news. He's managed to redirect a squadron of fighters for air support. As Obi-Wan and his troops rally for what appears to be a last stand, Y-Wing bombers soar overhead and bomb the enemy tanks that encircle the Jedi General. I have to say, I was genuinely relieved to see air support arrive. The shots of the clones cheering as the bombers flew past were framed well, and the clones seemed very human at that moment. Anakin, Ahsoka, and Ki-Adi-Mundi arrive at Obi-Wan's side, and the group plans the final stage of their mission. Anakin and Ahsoka lead a full Republic charge, followed by the clones -- some of whom are very unlucky and are swept away by the insects. I liked these tracking shot of Anakin and his troops as they began their attack -- it felt very cinematic and made the battlefield feel more open. It was also very creepy to see the clones being picked off one by one by the Geonosians. Clone troopers throw "droid poppers" at the Separatist forces -- the charged grenades neutralize the droids' weapons, allowing Republic walkers to lumber forward unharmed by enemy blasterfire. These walkers blow up the gun emplacements and destroy the shield generator, thus accomplishing the Republic's mission. As the shield falls, Ki-Adi-Mundi's gunships arrive with reinforcements. With the mission a success, Anakin and Ahsoka again compare kill scores. Ahsoka narrowly beats Anakin 60-55, but just before their gunship departs, Ki-Adi-Mundi says, "65." Anakin asks him what he means, and the wise General says that this was his kill score. I really like that he joined in with Anakin and Ahsoka in their body count game. His line, "What do I win? ", and the subsequent joke about Anakin's gratitude, were a great way to end the episode. Some miscellanea now, before I get to my final thoughts. I believe this was the first time that we've seen the Jedi in a full-scale battle with flesh-and-blood enemies. It's been too easy for the Jedi to just destroy battle droids up to this point. Bringing in living beings takes the intensity up a notch. And the Geonosians were a great choice for the first living enemy we see the Repulbic take on -- they're positively creepy in those claustrophobic cavern scenes, especially when they grab a clone and whisk him away. Also, what was the deal with Yularen in this episode? It seemed like he had nothing better to do than say "No" to everything the Jedi requested. Shouldn't he be trying to help their mission without regard for the strength of an ancillary mission (the space blockade)? I don't think this was due to poor planning on the part of the writing team. I actually think it was a conscious decision to have Yularen start to push back against these "mystics." To conclude this review, I will simply say, "Best. TCW. Ever." This was hands-down my favorite episode of The Clone Wars Season Two. It also ranks in my top five all-time favorite TCW episodes. Why? Put simply, I love action. Before TCW went on the air, numerous blogs were citing sources that called the new animated show a cross between Star Wars and Band of Brothers. To be sure, Landing at Point Rain was one of the best examples of this crossover. I have not felt this involved in an episode of the show in quite a while. I was also blown away with how perfectly Dave Filoni's team executed the various panning, tracking, and sweeping shots employed in this episode. More than anything else, Landing at Point Rain felt cinematic.